Typically, I don't let these rise twice (I know, I'm lazy). I make the dough, form into breadsticks and place them on the baking sheet to rise. This cuts 1 1/2 hours off of the time. Plus - I don't let them rise for the full hour, just until I think they are ready. 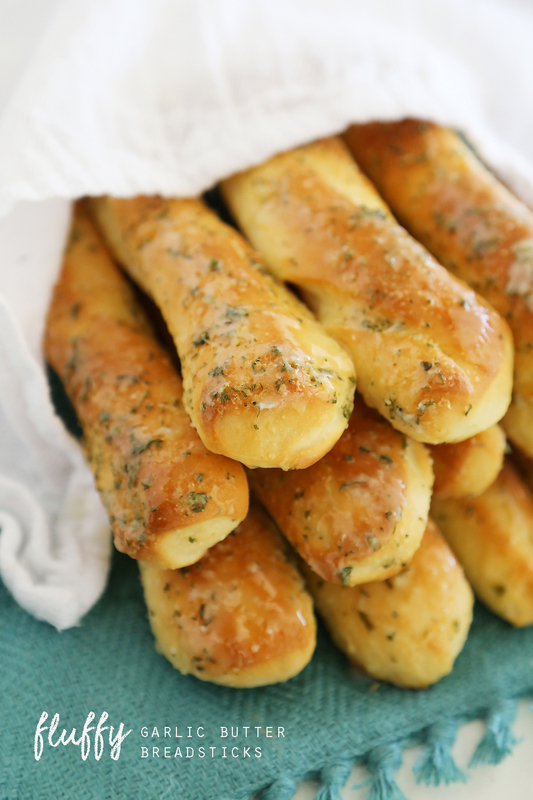 The breadsticks come out more dense than fluffy, but we like them that way. In the bowl of an electric stand mixer fitted with the dough hook, combine all ingredients for dough except flour. On low speed, gradually add flour. Increase speed to medium and knead dough for 7 minutes, or until smooth and elastic. Remove dough to a lightly oiled bowl and cover with a dry towel. Let rise in a warm place until doubled in size, about 1 1/2 hours. Divide dough into 12 portions. Roll each piece of dough into a 7-inch log. Place dough logs on nonstick baking mat or parchment-lined baking sheets, cover, and let rise until doubled in size, about 1 hour. Preheat oven to 400 degrees F. Bake for about 12 minutes, or until golden brown. Meanwhile, combine butter, salt and garlic powder in a small bowl. Remove breadsticks from oven and immediately brush with butter mixture. Serve warm.